The palettes are there so everyones using the same colour shades for their respective machine. But we're not going down the line of the other retro comp whereby that was 16 colours maximum. For example if you wanted to do a black outline on a sprite then you could use RGB 0,0,1 to visually look like a black outline colour if you are using 0,0,0 for transparency. Visually it'll still look like your choice of machine. Make sense? I'm not going to start a worklog, just (hopefully) a completed game by the deadline. That brings back bad memories (I was really ill when working on Burger Time, so it never got completed). Working on a maze game. Interesting - seems it was a pretty good palette choice. I did such a thing for my unfinished Santa Game in 2017. Pay attention that you cannot use all color variants. The less brightness variation between two base colors, the less visible it will be. also: the more area you cover with such an artificial color the more visible will it be on "hickups" (if you eg. cannot guarantee 60fps). contains some gamesprite helpers which help creating such a "fake color" gamesprite by splitting a given image into two variants - each only consisting of the 16 base palette colors. This allows to paint your sprite without paying too much attention on hitting the absolute correct palette colors - or if you prepare a palette of 16base + some "mix colors" it will take care for correct color alternations to result in a "as much as possible" representation of the original image. 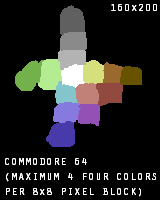 The principle should work on all these retro consoles as long as the colors have a similar brightness - which is why it works so good on the C64 palette (as its less "vibrant"). Here I already use some more colors. Maybe it would be good to create "non flicker colors" based on brightness-difference (so the more equal the "bigger" a painted area could be without artifacts). Speaking of which has any one explored the [2 layer multi color] sprite method on old hardware. this was an old technique for a sonic the hedgehog game on the neo geo pocket of all things. I've wanted to test this method on something others then any later system or hardware. I think there's only one person actually going for a game on the real hardware so probably isn't something that will be done this time. This kind of thing is what I most admire about the old computers and their limited functionality in certain areas. People did their best to try and find a way round it like it was almost a challenge. Some of the old C64 games were amazing for the hardware they were running on. totally ... later game's were almost on par with the 16 bit era in game play and art. sam's journey,Mayhem In Monster Land and Nebulus are certainly impressive examples. I've dipped my toe in, created a work log, obviously the superior format of the Spectrum 16K (with a wobbly ram pack for now) is my weapon of choice. Great link, tons of variations in there. I wouldn't have thought of using the grays as mid-tones. This allows to paint your sprite without paying too much attention on hitting the absolute correct palette colors - or if you prepare a palette of 16base + some "mix colors" it will take care for correct color alternations to result in a "as much as possible" representation of the original image. That's an interesting approach, painting a sprite however you want it (32bit ARGB mode), then using software to map the colors to some palette (indexed mode). Photoshop has this, I'll take a look into making a palette. This is a java application, so you can run it on most platforms, that is designed for drawing graphics for retro games. You can select one of the pre-configured palettes when you run it and then draw away with an application that resembles the old Amiga Deluxe paint very closely. 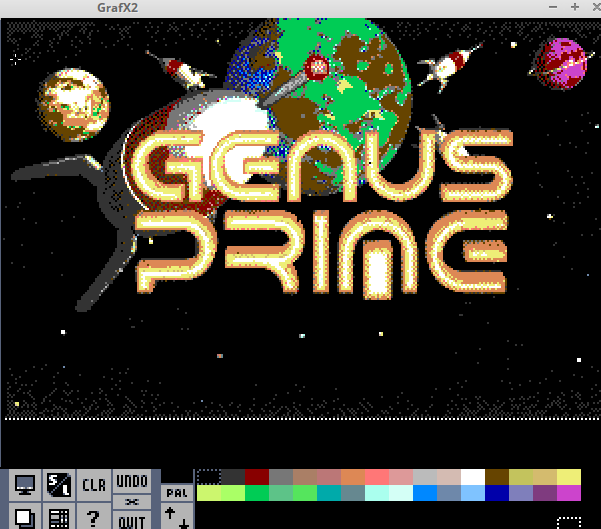 It has Spectrum, Amstrad, C64 multicolour and hi-res modes and, I believe, it won't let you draw in colours that would not be possible on the real machine - ie: more than one colour per 8*8 block on a C64 in hi-res mode, for example. I've not yet confirmed this but it's worth a look. Naturally you will need to be running Java to use it but that's not hard to find.